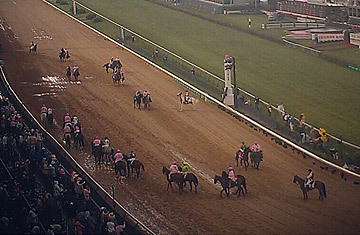 A general view prior to the 138th running of the Kentucky Derby on May 5, 2012 at Churchill Downs in Louisville, Kentucky. The day after a record-setting crowd of spectators had shuffled out of the world's most famous racetrack, police were gathered on the backside of Louisville's Churchill Downs to ask a 19-year-old groom to identify a body found in the back of a barn about 150 yards from where three-year-old I'll Have Another was resting after his come-from-behind win in the 138th Kentucky Derby. Wilson Perez confirmed that the man was his father and co-worker Adan Fabian Perez, 48, a groom from Guatemala who had tended horses at Churchill Downs since 2008. Police believe he was murdered sometime late Saturday night or early Sunday morning, though they are saying little about the condition of the body, or what they believed may have transpired in the hours after some 165,000 fans filed out of the famed track. That it was murder, police have said, was made clear by the wounds on his body and the location of the corpse, left in the back of Barn No. 8, an "unnatural place" for Perez to be, since the trainer who employed him, Cecil Borel, worked in another location amid the sprawling backside community where some 600 employees  many from all over Latin America  live among and sometimes above the stables. The day before had been a banner moment for Churchill Downs  and for the troubled racing industry itself, which needed just the kind of pitch-perfect kickoff to the annual Triple Crown competition that Saturday's Derby had appeared to provide. The crowd had bested a record set just last year, and Churchill Downs would later announce its profits more during this Derby Week were its highest ever. Bettors at the track, at satellite betting windows across the country and on the Internet, had wagered $131.1 million on the Derby race itself. The sport didn't need a headline to remind Americans that the pristine image of the Derby and of the beaming faces from the winners' circle often obscure a harsher life, one lived amid quiet labor by hundreds of grooms, hot walkers, exercise riders and struggling assistant trainers who keep the sport, and the horses, alive. Saturday night, as the television crews were leaving and the winning connections were being feted at Louisville's finest restaurants, the party on the backside among the grooms and other workers at Churchill Downs was a more hardscrabble affair. While hundreds live on the grounds, many more, along with spouses and children, live in apartments that are within walking distance of Churchill Downs, which is situated in one of Louisville's poorer neighborhoods. Police say several altercations  including at least one broken up by the cops  erupted in the immediate wake of the race, even as the festivities continued. Police stressed during a Monday press conference that they have found no connection between Perez's death and the disturbances on Saturday night. John Asher, a spokesman for the Churchill Downs Inc., said the death of Perez had more to do with the sometimes messy consequences of people living in a community  any community  than it did with racing, with Churchill Downs or the Derby. "It's a little city," Asher told TIME. "A lot of good things happen there, but occasionally when you have that many human beings together, bad things will happen." The murder has left residents of the tight-lipped backside community on edge. On Monday night, about 150 gathered at a trackside prayer service, a regular event that, having become a memorial, took on more an unusual poignancy, with Perez's son Wilson, as well as his boss, trainer Cecil Borel, in attendance. "There are some folks who are ill at ease with what's happened, understanding that the person [who killed Perez] could still be here," the Rev. Ken Boehm told TIME. "We don't know that he or she is or is not, but we know that a heinous act has taken place in our back yard." He said the workers  the grooms, stable boys, practice riders and others who make up the workaday life of a track, far away from the betting public  have begun "watching out for one another and not putting yourself in a situation that could be catastrophic."